Tony’s Gallery on Sclater Street, Shoreditch just a short walk from the art hub of Redchurch Street and Brick Lane offers a different kind of exhibition that is both exciting and overwhelming. 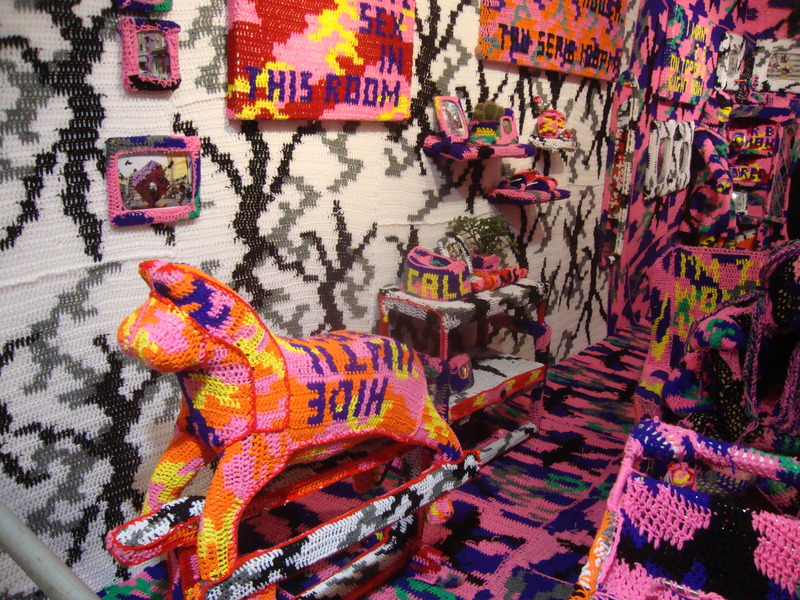 This small space is filled from floor to the ceiling with the knitted creations of the Polish, New York based artists Olek. This is her first UK solo exhibition and it has hit the ground running. Titled ‘I do not expect to be a mother but I do expect to die alone’ (a direct quote of Tracey Emin from 2002) the artist has filled the space with household objects and hangings constructed in crochet. 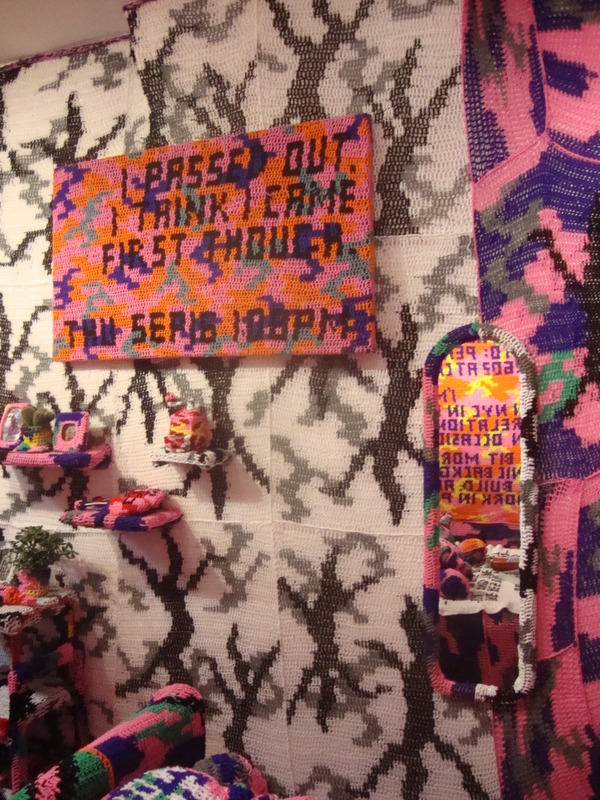 Olek has travelled from guerilla knitting a jumper for New York’s famous Wall Street Bull to being listed as one of ‘the 25 most important artists of 2011’. She has become a key figure in the artworld and this exhibition goes to prove that her originality is making her a key figure in the art crowd. Work on display is frantic, filled with psychedeila and is lighthearted yet it carries a strong undertone of sexism and modern culture. 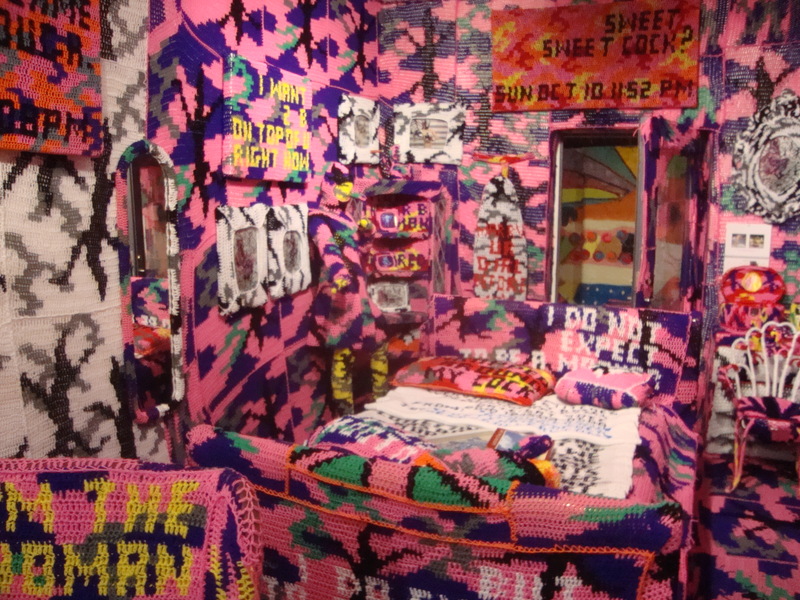 A personal look into Olek’s colourful bedroom highlights her talents but also her vulnerabilities. Here she is seen as taking a strong step for herself yet shows her human weaknesses, her feelings of isolation, abandonment and untapped potential signified by the empty shopping cart, bed and cradle are on display for the scrutiny of the viewer. She highlights everything we fear in a heady and colourful medium that is both jarring and enthralling at the same time. This exhibition is exciting, innovative and unique, head down there to catch one of the hottest artists before she becomes truly massive.